Today I’m starting a new series of posts. Every week I’m going to share my love for an individual agency. I don’t know for how long but there’s going to be a few at least. I’m not sure which ones yet but I have an idea. And I’m not going to go for too obvious ones. It’s going to be single offices, not networks. I’m going to start out with Colenso BBDO. Thanks to them you could say that Auckland and New Zeeland is one of the best places in the world for advertising. It’s also as far away from Sweden one could possibly go without leaving the planet. But I still consider if I should sell my soul for an internship spot there. Keep reading and you’ll see why. Here’s me and my doggelganger. It’s modern advertising at it’s absolute finest. Don’t just say you’re good. Do good and people will know you’re good. But it’s not doing some small thing. This actually helps mistreated dogs find new homes. Pedigree is making the world a better place when they spend their advertising budget on this. And Id’ like to thank their marketing director for saying yes to these ideas – because there is a follow up. Or a new campaign maybe. This time they, once again, utilize new technology. But instead of facial recognition it’s a 3D cinema experience. Watch their mischievous use of 3D glasses below. Being able to show two different things at once is new. You can only do this because of the 3D glasses technology. And I think this example shows how important it is to be on top of new trends and tech. This stunt will be replicated, mark my words. 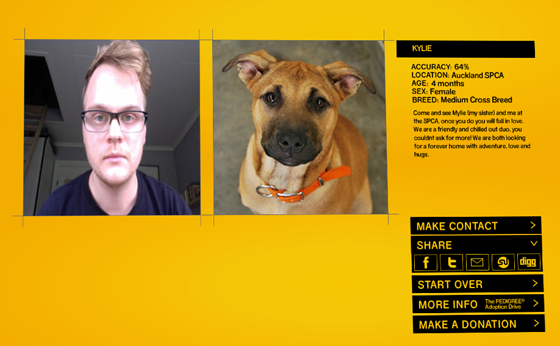 But Colenso BBDO has made other great campaigns. Like the Books Shape You campaign for the New Zeeland Book Council. And to finish you off I’ll leave you with a viral campaign. A clever one that used the product packaging and a very natural ingredient to create an interesting buzz. I like this so much because they went out on a limb (pun intended, sorry). For two weeks they just stood there while people complained. The negative publicity was surrounding them, but they didn’t give in. They followed the plan, waited two weeks and then “apologized”. Lastly I’d like to thank Colenso BBDO and their clients for making the world of advertising a better one. Keep breaking barriers and keep doing ads that give more than they take. I’ll keep my eyes on you, because I know I’d love to work with you some day. This ad stunt was made in advance of the Euros. I really hope it worked. Volkswagen had a big hit last year with their The Force advert. Almost 50 million viewed it on Youtube, an enormous feat for commercial. This year they even released a teaser for their upcoming super bowl ad. After seeing a lot of blog posts about this, I felt that I had to comment. But I don’t really know what to say. I guess it works, because dogs are cute and they keep following the Star Wars theme. But other than that it’s kind of ridiculous for an ad. But just as the gorilla ad for Cadbury these ads can be very entertaining and I’m sure that this will go viral in no time. What’s harder to say is if it’s going to sell more Volkswagen cars.